It's time for winter holidays! Every December we do an evening program called Holiday Hoopla! There are songs and stories and activities and it tends to last for about an hour. Some things change and some things don't, but here's how it tends to go down. Welcome everyone and introduce the children's department (we're all involved). Everyone sings "Let it Snow!" Before the program, we've cut up white scrap paper into tiny bits of confetti. Every time we get the chorus and sing "Let it snow! Let it snow! Let it snow!" we throw the confetti on the audience. Then we play HUMAN DREIDEL. This is my favorite part. (I'm the human dreidel.) My co-worker took a cardboard box and cut a head-hole in the top and covered the box with paper (thing basic robot costume.) She then wrote the Hebrew letters on the side of the box. I put the box on and! voila! instant dreidel. After a brief rundown of the rules, someone spins me round and round (like you would before pinning the tail on the donkey. Sometimes we use an office chair, but when I stand, I can staggar around afterwards for greater comedic effect.) In real dreidel, if it lands on hay, you get half the pot and if it lands on gimmel, you get the whole pot, so if it lands on either of those, I throw candy at the audience. If it lands on nun, you lose a turn so we spin again. If it lands on shin, you're supposed to put candy into the pot, so I demand the kids give me candy and then cave and throw more candy at them. Then we all sing "The Dreidel Song"
Sing a general winter song. This year was "Jingle Bells." We handed out bells to everyone to jingle as we sang. Sing "The Twelve Days of Christmas" For this one, we have pictures for each of the days printed out and on each chair. When we get to your day, you have to stand up, so there's a lot of quick standing and sitting, which always leads to general hilarity. Sing a Kwanzaa song. This year it was "Kwanzaa Time"
We mix it up a little each year and it's always a lot of fun. Some years we do a King Cake with the refreshments. Sometimes we have red circles cut out that everyone can hold on their noses as we sing "Rudolf the Red-Nosed Reindeer." So, from us to you, hope you're having a happy holiday season! Are their any winter holiday books left on your shelves? We're running pretty low! 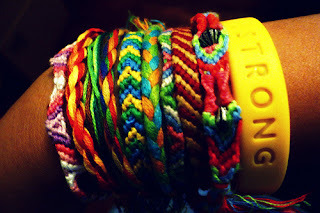 Every Monday afternoon this November, we had a friendship bracelet program for kids 8-12. The plan was pretty simple-- we'd learn a basic bracelet the first week and get progressively more complicated. You could come to one or all of the sessions. To prep, I ordered some bulk craft thread from Amazon. 150 skeins, multiple colors, for under $18? YES PLEASE. I then cut every skein into thread lengths 2 arm-lengths long. (This is too long for the easier bracelets, but the right length for some of the harder ones.) Pre-cutting the thread really sped up the "chose your thread and sit down" process so we had more time for knotting! I highly recommend pre-cutting the thread! Then, I practiced. I hadn't made a friendship bracelet in a really long time, so I checked out our books on friendship bracelets and picked ones I thought we could do and practiced, practiced, practiced. When I was a kid, I used to safety pin the bracelets to the knee of my jeans. As an adult, I used a clip board. I wish the library had 20 clip boards so the kids could have used them, too. But, the library doesn't. We just used tape and taped them to the table. As the program was after school and almost everyone was wearing uniform pants or skirts, I didn't want to go with the safety pin. I didn't want any justifiably angry parents calling me about holes in their clothes! The plan was... the first week we'd made the skinny bracelet.This only uses the basic forward knot, so was a good way to practice our skills. The second week, we'd make a basic 3-color stripe bracelet.This also only uses the basic forward knot, but is a little more complicated. The third week, we'd make a chevron bracelet.This introduces the backwards knot. The fourth week, we'd go crazy and do a diamond pattern.This involves forward knots and backwards knots and working in sections. But... most of us had a hard time mastering the 3-color stripe bracelet. Amazingly, they didn't believe that it was as easy as it was and kept trying to make it harder. So, the third week, we did a 4-color stripe bracelet, which is the same thing but with an extra stripe. I had one girl who came in already knowing how to do some friendship bracelets, so I showed her how to do the chevron. At the end of the session, one of the kids asked "Miss Jennie, do I have to keep doing this? Or can I just do it my own way?" My dad says quitters never win, but I say quitters always win, because when you quit things you end up making more time for finding out the things you love, such as rock collecting. And I said, "Do what you want! Discover something new! Have fun!" I may have channeled Miss Frizzle there, too. So, the fourth week, I set it up as free time. I had the supplies and the floss and I would teach them a bracelet or help them and they could just make what they wanted. So, was it a success? YES. Lots of kids came and everyone had a great time. Did it go as planned? No, but that's not important. They invented some really fun bracelets, learned a few new skills (even if they weren't the ones I had planned) and, like I said, had a great time. I do recommend having extra experts to help out. A lot of kids needed individual help and having an extra adult or two was super, super helpful. This website is super-helpful for brushing up on your knotting skills. There are also a ton of tutorials and videos on YouTube.